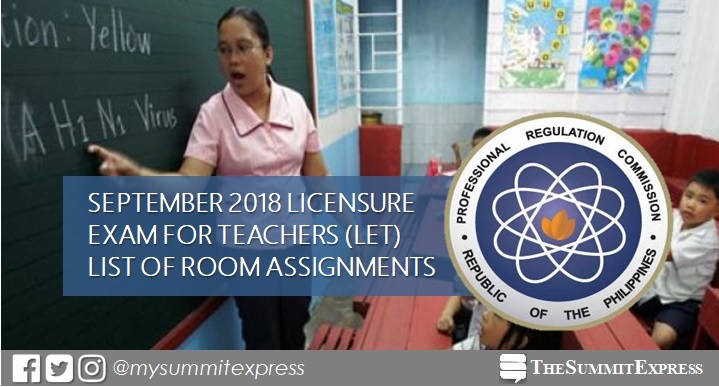 MANILA, Philippines – (Updated September 29) The full list of room assignment for September 2018 Licensure Exam for Teachers (LET) or teachers board exam for at least 25 testing centers nationwide is available online. The Professional Regulation Commission (PRC) and the Professional Regulatory Board for Professional Teachers (BPT) will conduct the second LET this year on September 30 (Sunday) for Elementary and Secondary levels aspiring teachers. According to PRC Resolution No. 2017-1068 series of 2017, the September 2018 LET shall be conducted in Manila, All Regional Offices; Zamboanga, Bacolod, Rosales, Pangasinan, Laoag and General Santos City. 1. Check and visit your school and room assignment in 2 or 3 working days before the examination. 2. On the day of examination, report to the school/building assignment not later than 6:30 AM. Be punctual. Note that LATE EXAMINEES WILL NOT BE ADMITTED. 6. You are allowed to bring food and eat inside the examination room. 9. Impersonation is a ground for disqualification in this LEPT and in future examinations. The second licensure exam for teachers this year covers general education and professional education subjects (Elementary Level) and with the inclusion of specialization for Secondary Level only. Note: Separate test booklets will be used for the General Education (GE) and Professional Education (PE) subjects for both elementary and secondary levels in the September 30 LET. To pass the examination, taker must obtain an average rating of not less than 75% and must have no rating lower than 50% in any of the tests. The Summit Express will also update this site for the results of September 30, 2018 LET board exam. You may also check out the official website of PRC (prc.gov.ph) for more information.